If third wavers are good at anything, it’s following trends and adopting new dogmas. If I didn’t know any better, I would say that most young baristas are glued to Instagram all day, just waiting to see what trend they should unquestioningly follow next. Call me crazy. One of the stickier trends in the past couple of years has been the near-religious adherence, at least in the US, to the 2:1 espresso-brewing ratio. I’d like to discuss what an espresso-brewing ratio (EBR) is, why it’s relevant, and why it’s a little silly for so many cafes to latch on to this suspiciously harmonious ratio. What is an Espresso-Brewing Ratio? Simply put, it’s the ratio of an espresso’s beverage weight to the weight of the dry grounds used to make the shot. For example, if a barista pulls a 36g shot from 18g of grounds , the ratio would be 2:1. I suspect most baristas do not realize this: if you have exact targets for extraction % and TDS, there is only one EBR that can produce a shot that achieves both targets. For example, let’s say you desire a 20% extraction and 10% TDS. Using a slightly simplified calculation, the only EBR that can produce a 20% extraction/10% TDS shot is a 2:1 ratio. A 2:1 EBR can yield a spectrum of extraction/TDS combinations; for example 8% TDS/16% extraction or 9%TDS/18%ext. But no other EBR can produce any of the combinations mentioned above. *These calculations are slightly simplified to help illustrate the concept; please don’t get hung up on the imprecision. Sam Sgambellone of Coffee Kaizen generously shared this chart showing the possible extraction%/TDS combinations possible with various EBRs. Thanks, Sam! 1. A cafe should choose its EBR, ground dose, and shot weight as a system, based on the style and size of drinks it serves. 3. 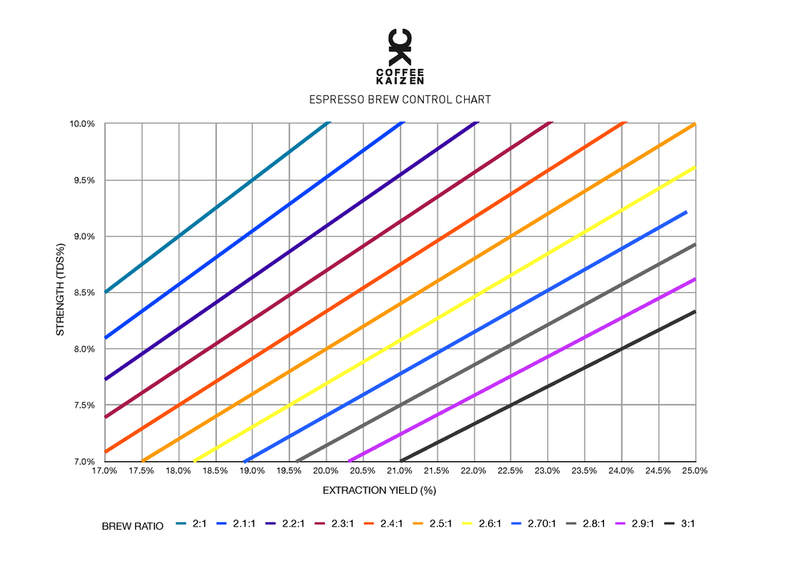 Most cafes using a 2:1 ratio serve underextracted espresso and should explore higher EBRs to make their espresso riper, less sour, and less sharp. Based on these assertions, the “one size fits all” approach to EBR seems a little unreasonable. The first shot is destined to be drowned in a 16oz (450ml) latte in the US. For the coffee flavor to not disappear in the milk, the barista may want to cram as much coffee solids as reasonably possible in the drink. The barista may choose a large, 20g dose and a higher EBR, of let’s say 2.5:1. At a 21% extraction and 8.4% TDS, the baristas has added 4.2g of coffee solids to the latte. The third shot is pulled by a barista in Melbourne as a “short black.” To provide high extraction and good flavor clarity using a light-roast geisha (washed, of course), the barista may choose a high ratio such as 3:1 and modest TDS. For example, most Australian baristas “split shots” (pull two separate shots per portafilter) and may use 20g of grounds and a 3:1 ratio to yield two short blacks, each a 30g shot from a 10g dose. Such a shot may have an extraction of 22% and TDS of 7.3% to optimize flavor and clarity at the expense of strength and body. I can’t tell you what the “best” extraction level is for your espresso shots. But I will tell you that you’ve probably never had an overextracted espresso. What?? Yes, it's true. Sure, you’ve had shots that were channeled, bitter, or had overextracted flavors. But when’s the last time you accidentally pulled, say, a 26% extraction, without doing something extreme, like using a 10:1 ratio? The “overextracted” shots you’ve pulled were channeled, or perhaps your burrs were dull or misaligned, but your shots were not overextracted in the mathematical sense. If you’re pulling 21% shots using an EK and you think they’re overextracted, check your burrs and your puck prep prior to lowering your extraction target. Baristas should usually aim for the highest extraction possible when using standard EBRs (very high EBRs will always channel extensively, and in such cases maximizing extraction may not be wise.) If you taste symptoms of overextraction, work on your puck prep and ensure you’re using adequate preinfusion (very few baristas do). Most cafes attempting to use a 2:1 ratio are underextracting their espresso. The most important reason most baristas should question the 2:1 ratio is that they may be serving underextracted espresso. By “underextracted” I simply mean the coffee would taste better if the extractions were higher. Simply put, if you’ve got a setup such as a Mazzer grinder (low extractions) and a La Marzocco Linea (no proper preinfusion, no pressure decline), and you use a 2:1 ratio, you’re likely underextracting. Using an espresso machine that offers slow, low-flow preinfusion, or a well-programmed pressure-profile machine, and/or using a higher-extracting grinder, such as a Mythos or a Peak, can each significantly boost extraction quality and quantity. Unfortunately, equipment selection is another area where baristas and shop owners do more trend following than analytical thinking, but more on that some other time. This is not a foolproof test, but it’s worth trying, and takes only a few minutes. Let’s say you typically pull shots with 2:1 EBRs using 18g in/36g out in 30 seconds. Try this instead: set your grinder one small notch coarser. Purge a couple of doses from the grinder. Pull a 3:1 ratio shot (18g in/ 54g out) in 30—35 seconds. You've now likely increased extraction by more than one percentage point. Assuming the shot did not channel more than usual, taste the coffee and evaluate whether you prefer the flavor to that of your 2:1 ratio shots. If you were underextracting at 2:1, you’ll likely find the 3:1 shot is juicier, less sharp, and less sour. The test is imperfect, primarily because we’ve changed the flow rate, but almost all baristas who have done this test with me preferred the flavor of the 3:1 shot over the 2:1 shot.